Main city of the Vomano valley, in front of the Gran Sasso d’Italia, before its name, up to the 1887 it has been known as “Le Quote”; from 1887 up to 1927, instead, its name has been changed in Rosburgo. This territory has been inhabited since the Roman era, indeed some of its areas are mentioned in a lot of documents dated back to the Middle ages. Today Roseto degli Abruzzi, is the main city center of the coast in the Province of Teramo and one of the most populated. In the center of Italy, Roseto can be easily reached. The nature and the climate, mild and kind as its inhabitants, made Roseto degli Abruzzi the right place for a quiet and relaxing holiday. The beach, in Roseto degli Abruzzi, has been awarded from 1999 with the Blue Flag of Europe; the city is known as a bathing resort for a century, since when, in the early 1900, the fishermen gave at disposal their houses and thanks to the hospitality of the professionals in tourism, who for generations have took care of the tourists. Today the city has a lot of hotels, villages, campings that can host any kind of tourist. The beach has many beach resorts where, at day, it is possible to relax and, at night, it is possible to have fun. The promenade is rich in palms, maritime pines, oleanders and, of course, roses: it is so romantic toh ave a walk after a day at the beach, appreciated for its clear waters and the low bottoms, that are suitable for children. One of the most important moment of the year is the 15 th of August, when the statue of the Virgin Mary is lead in procession on a fishing boat and, at midnight, there are amazing fireworks. 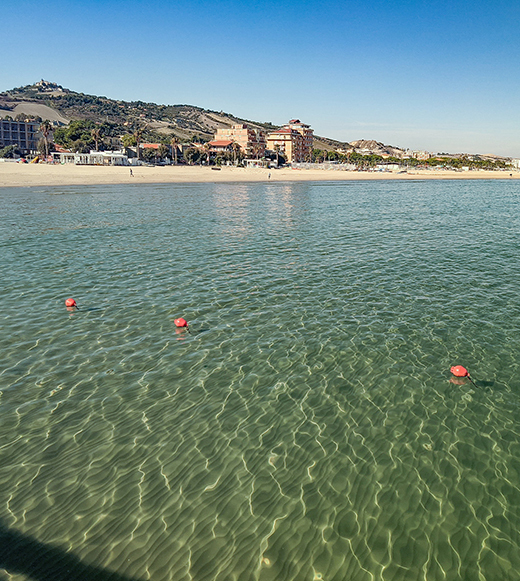 In Roseto it is also possible to do shopping in one of the typical markets, have a walk at the Harbour, to do sport ad fitness, soccer, beach-volley, beach-basket, swimming pool, recreational fishing, skating, tennis, bocce, windsurf, cycling and much more.